Just making a mean face…I promise. Woohoo!! Can’t wait for this new Chapter to unveil iteself to us!! GREAT and beautiful work as always, Scott! I hate to say it, but…. is it me, or does the dwarves have no eyes at all?? there’s not even an line to show us that his eyes are closed. I think the eye “line” is obscured by the heavy brows? 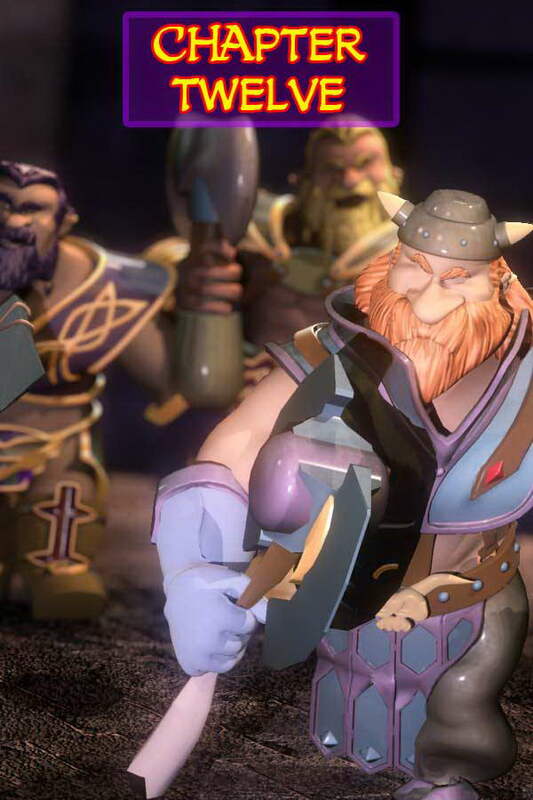 I like the look of the dwarves though Scott, can’t wait to see more! Is it just me or is the dwarf in front missing a leg? lol, no he’s walking, he has a leg, it’s just in the shadows! By the way, is the rest of the site ever going to be changed to the new format? WOO!! I can hardly wait till chapter 12 gets started!!! ^__^ YAY!!! that bit about the eyes made me laugh, many debates have been raged between my friends one whether or not they truly have them, seeing as how they always seem to be in underground tunnels. can’t wait to see how this continues to unfold! The splash page is TEMPORARY. Just to get us through the weekend. People were having problems finding the FIRST PAGE. Wow the new features are soo nice! can’t wait for the new chapter!! is it me or do these guys look like clay? Watching the website evolve here here has been interesting. Having lived through several major home remodelings, I can appreciate the effort involved in trying to get on with your normal routine while living in a construction zone. It looks the the introduction of dwarves into the story line is going to add some new twists. You’ve already dropped some hints to set up the situation, can’t wait to see how it plays out. Hang in there, and keep the good stuff coming Scott. There appears to be a small hand reaching out of the dwarf’s pants, just above the belt. That appears to be a bit more disturbing than the eye question. Could this be the reason no one talks about three handed dwarves? Yah, I gotta admit the model quality on the dwarves is certainly lacking in comparison to other models; I don’t think they were really suited to such a close up, as they are too low poly. I just want to say this comic is absolutely awesome. Your creativity, work, artistic ability, and story-telling skills are absolutely brilliant. Im going to have to buy these books. Do they come in color? but one thing…just starting today, this website has begun sporadically sending me to a .html page that won’t load. Um, usually the artwork is great but the dwarves’ axes look really silly. Is it just me, or does that main dwarf look like Honeydew(Simon)?